This is the time of year when you can find Meyer lemons in abundance in California, especially in the Bay Area. They are delicious and very different from the usual Eureka lemons you find in the grocery store. At their best, Meyer lemons are large, nearly the size of oranges, and a beautiful golden-yellow color richer than store-bought lemons. They have a citrus smell that seems like a cross between lemon and orange, and they are sweeter than Eureka lemons, though not so sweet that you would eat one out of hand. With the abundance and special qualities of Meyer lemons, California chefs – and even those in Santa Fe – go crazy with Meyer lemon curd, Meyer lemon pie, Meyer lemon cake – you get the idea. On our recent trip to San Francisco, I found some beautiful Meyer lemons at the Marin Farmers’ Market in San Rafael. I bought a couple of pounds, and brought them home in my checked bag. I didn’t have any specific plans for them, so I leafed through some of my new Christmas-gift cookbooks from the Bay Area. Thomas McNaughton, chef at Flour+Water, had an interesting recipe for preserved Meyer lemons in his book, so I thought I would give that a try. I followed McNaughton’s recipe (sort of) with the plan of making a gallon of preserved lemons. I had to buy a gallon-size glass jar, and unfortunately I wound up not having enough Meyer lemons. I found some at our local Whole Foods, offered in little net sacks. The lemons were literally a pale comparison with my California beauties. They were yellow, small, and blemished with soft spots. Still, I bought them, and wound up needing about 7 pounds of Meyer lemons in total to complete the recipe. Preserved lemons are a tradition in the cuisines of North Africa. The basic preservation method is brining, so most cooks wind up not using the flesh or juice, but just the peels, finely cut, to provide a citrusy taste to many things including meats and stews. (there are some recipes for using the flesh, but it must be incredibly salty.) Cookbooks provide an abundance of methods for preserving lemons. Sandor Katz describes the basics in his encyclopedic, The Art of Fermentation and Deborah Madison gives a simple recipe in Vegetarian Cooking for Everyone. McNaughton’s recipe calls for way more salt than I used. Even at that, the undissolved salt sits at the bottom of my jar of lemons as they preserve away in the coolness of the garage. Sugar and spices make McNaughton’s recipe unique, and I followed his guidance. The jar of brined Meyer lemons ready to be topped off and set to age. Sterilize a 1-gallon glass container with non-reactive lid by boiling in water for 10 minutes or washing in dishwasher set on hot. In a large bowl, combine the salt, sugar, and spices. Prepare the lemons by slicing them in half from the pointed end to the stem end, stopping ½ inch from the base. Turn the lemon one-quarter turn, and make a similar cut so that each lemon has four quarters joined together by the uncut portion. Pour ¼ inch of salt-sugar mixture into the bottom of the glass jar. With a tablespoon, sprinkle a heaping tablespoon of the salt sugar mixture into the cut lemons, one by one, and then arrange them, cut-side up, in the jar. Pack tightly. When you have a layer of lemons packed in the jar, sprinkle more of the salt-sugar mixture on the top, pressing down with a potato masher to express as much juice as possible. Layer by layer, continue packing the jar with prepared lemons and adding a layer of salt-sugar mixture on top of each layer. Continue to press down each layer with the potato masher. Top the lemons with more salt-sugar mixture, seal the jar, and set it aside for 48 hours. At that time, add more salt-sugar mixture and, if necessary, lemon juice so that the lemons are completely covered. Seal the jar tightly and set in a cool, dark place for three months. When the lemons have been completely preserved, store them in the refrigerator for up to a year. Other recipes call for less salt, and I think you could cut back on the salt. Use pickling and canning salt. Regular table salt may leave a residue from the anti-caking agent that is used. The lemons must be completely covered with liquid, otherwise they are likely to spoil. Use tongs when removing lemons for use. Hands, no matter how clean, may introduce organisms that can lead to spoiling. Rinse the lemons well before use, as they will be quite salty. Use the rind and discard the flesh – unless of course you want to experiment with it. There’s no recipe in this post or much discussion of food. Honestly, I just wanted a chance to show some of my images from our recent visit to the Ahwahnee Hotel in Yosemite National Park. Yosemite National Park is one of the true gems of the national park system in the United States. It was viewed as a treasure by the Native Americans who lived in it, and by early settlers and prospectors. Even shortly after gold rush days, there were efforts to protect Yosemite Valley. In fact, it celebrates its 125th anniversary as a national park this year. If you have visited the park, you know what a special and magical place it is (sans other tourists, if you could wish it). If you have never visited, it is a must on your list of places to visit. The Ahwahnee Hotel, by itself, is a place that deserves its own spot on your list. The hotel was opened in 1927 at a cost approaching $2 million – a huge sum in those days. The story is that earlier lodging in the park could best be described as “rustic”. Many wealthy tourists including Lady Astor refused to visit because of the primitive conditions. For that reason the hotel was envisioned for that clientele. It was built in a grand style but in a fashion that blended into the beautiful mountain surroundings. Fearful of fires that had already destroyed more than one national park lodge, the builders used reinforced concrete stained to resemble California redwood. Even today, the eye of the visitor will be fooled by the exterior of the building. Of course, the hotel has been modernized to remain attractive to demanding guests, but many of the original details including giant fireplaces, intricate woodwork, artwork, detailed floors, and even wooden ice chests on each guest wing have been preserved. The main dining hall is in the impressive style of many of the classic national park lodges. The food is definitely a cut above the fare in other national park lodges. Most agree that the best time for a visit to Yosemite and the Ahwahnee is in the spring when the many waterfalls are at full flow. Next-best may be the autumn with colorful foliage and Indian Summer weather. Summer is beautiful with the only downside being the wall-to-wall humans. Winter is clearly the low season. Snows can be fierce, and more than one visitor has gotten lost and frozen during an ill-conceived hike. The plus side is that there are many fewer visitors. That has posed a problem for the famous Ahwahnee Hotel. Unlike many of the grand old hotels of the national parks, the Ahwahnee stays open all winter, so it needs to attract as many guests as possible. They do that with various special activities. The Bracebridge Dinner is a tradition that goes back to the first year that the hotel was opened. The dinner is a festive occasion with English period costumes, entertainments, and foods. It is extremely popular and becomes oversubscribed very early. The Vintners’ Holiday is a gathering of thirty or more California vintners and guests who talk about things wine-related and wind up with a festive dinner complete with carefully paired wines. For the past 30 years, the hotel has been sponsoring its Chefs’ Holiday. There are back-to-back sessions that run through January and early February. This year, there will be a delay of a few hours on Super Bowl Sunday so that football fans/food enthusiasts will not need to miss either event. The Chefs’ Holiday attracts many well-known chefs and food writers, predominantly from California, but actually from all around. This is the second year for Sarah and Evan, but other chefs and writers include Kent Rathbun from Abacus in Dallas, Nancy Silverton and Mary Sue Milliken from Los Angeles, as well as Duskie Estes, Elizabeth Faulkner, and Zoi Antonitsas of television competitive cooking fame. Guest chefs provide a short demonstration of one of their signature dishes and then host a tasting. Each session ends with an elaborate dinner prepared by the chefs, complete with carefully paired California wines. It is fair to say that the Ahwahnee staff is doing their part to assure a successful winter season in Yosemite. Every Friday evening, our village market holds a wine tasting which has become a neighborhood gathering. The market owners use the event as an opportunity to introduce new products. One that caught my eye recently was a package of potato gnocchi imported from Italy and made by Del Destino Foods with the advantage that they required no refrigeration and could be stored in the pantry. I very much like well-made gnocchi, although they are somewhat hard to find, even in good restaurants. They are often too leaden or else disintegrate rather than being the fluffy cloud like pillows that they can be. I’ve tried to make my own, but they take a bit of work and mine have really been no better than others. I was inspired to buy a package of cellophane-wrapped gnocchi for a trial at home. I could have just opted to cook them according to directions and top them with olive oil and grated Parmesan. To make the meatballs I used a #60 scoop. I didn’t know what that meant, so when I looked up scoops, I learned that they are assigned a number according to size, the number referring to how many scoops it takes to make a quart. So a #60 scoop holds about ½ ounce, level, and more when heaping. In this recipe, you should expect about 30 meatballs. I liked the way everything turned out, and the gnocchi were good, not great. At least they were not sinkers, they had a good taste, and they were fast. In fact, they were good enough that I will try them again. However, I’ve also made a plan to make my own soon. In a small bowl, combine the bread crumbs and milk. Stir to mix thoroughly and set aside. In a larger bowl, combine the ground lamb and egg. Stir in the milk-bread crumb mixture, shallots, and pepper. You may need to use your hands to get the meatball mixture well combined. Adjust the seasoning with salt, pepper, and, if desired, Italian seasoning. Form the meatballs to the size you desire. I think smaller is better. In a saucepan over a medium flame, heat the olive oil until it shimmers. Add the meatballs in batches, turning them until they are completely browned. Continue to sauté for an additional 5 minutes until they are cooked through. Keep warm until you are ready to compose the serving bowls. Place the parsley, mint, garlic, and Parmesan cheese in the beaker of a food processor. Pulse, gradually adding olive oil and stopping occasionally to push down the sides with a spatula. When the pesto has reached the desired consistency, add the walnuts, pulse briefly, and adjust seasoning with salt and pepper. Lamb meatballs, mint-parsley pesto, potato gnocchi ready to eat. Arrange meatballs on top of the pesto. Serve immediately. Pass the grated Parmesan separately. It has been nearly a year since I last reported from Yosemite. Sarah and Evan have been invited again to demonstrate the preparation of one of their dishes and to prepare a dinner at the Ahwahnee Hotel. During the past year, things have changed in our family and with the park. Last year, Sarah was trying to cook while 8+ months pregnant. This year we were charged with watching a nearly four year old and a 10 month old while Sarah cooks. The park is still suffering from the results of last summer’s fires. There are great stands of blackened tree skeletons, and huge logging trucks are pulling enormous tree trunk s down the road. The drought and warm weather have both had their impact: there is no snow, and Yosemite Falls, usually frozen by this time of year, are without ice. In the Central Valley below, the reservoirs are nearly empty. Everyone is hoping for the rains and snows that don’t appear to be coming. Perhaps the biggest current news is the successful climb of the Dawn Wall of El Capitan by Tommy Caldwell and Kevin Jorgeson. Sarah and Evan’s demonstration was interrupted by the announcement, and since then the hotel has been abuzz with the news. All of the television networks appeared with cameras and had the climbers get up at 4 AM (After being on a sheer rock face for 19 days.) to give interviews for Good Morning America, Today, etc. Today, Susan and I took a drive while Sarah, Evan, and the boys were taking a walk – the first time they have had a chance to get out of the hotel and the kitchen. Our drive took us past El Capitan. There were still three bivouac tents hanging from the Dawn Wall, and there was a huge traffic jam of television trucks in the meadow where Caldwell and Jorgeson were giving yet more interviews. Then we drove past Bridal Veil Falls to the Tunnel View Point to get an obligate image of the whole valley including El Capitan and Bridal Veil Falls with Half Dome in the background. It is a cliché image, but it is so breathtaking that you can’t avoid it. Neither could a big crowd of people even in the middle of winter. Tonight, Sarah and Evan will serve a wonderful dinner to include aged duck lasagna and an almond-chocolate dessert. Mix together the water, yeast, honey, and olive oil. Add flour and salt to the bowl of a stand mixer. Using the dough hook, add the wet to the dry ingredients and mix to form a ball. Keep the dough in the mixing bowl and wrap the whole thing with plastic wrap. Let dough proof in a warm area of the kitchen for one hour. Once the dough has proofed, divide it into 70 g balls. Roll each ball out into an oblong about 1/4 inch thick. On a griddle or large cast iron pan heated to medium-high and seasoned with oil, sear each flat bread, cooking and browning on both sides. Clean cauliflower to remove most of the greens leaves and stem. Cut in half. Sear the blanched cauliflower on a griddle or heavy cast iron pan until golden. Then bake in a 350 degree F oven until tender. Season cauliflower with lemon juice, brown butter, and salt. Puree if desired or serve as is. In a mixing bowl, season the beans with pure olive oil (e.g. Mission Trail from Sciabica), some of the reserved cooking water, salt, Douglas fir powder, and fennel pollen. Using a fork, mash everything together until the desired texture is reached. The puree should be as smooth as hummus. Note: With both dips, you can spread them on pieces of reheated plancha bread and garnish with tiny cauliflower florets or thinly sliced radishes and caramelized finely sliced shallot. During our recent visit to Los Angeles, we stayed just a short walk from the pier at Redondo Beach, so we made a family outing between the various holidays. Everyone else for miles around decided to do the same thing, because the boardwalk was jammed with multi-generational families. Many of them were visiting with other multi-generational families giving a festive air to the occasion. The Redondo Pier is filled with attractions similar to those in other seaside tourist towns: restaurants, glass-bottomed boat tours, candy shops, and an arcade with an indoor Tilt-A-Whirl. Carol bought some live crabs, shrimp with their heads still on, clams, mussels and a couple of varieties of fish, planning to make a fish stew from one of her favorite cookbooks. New Classic Family Dinners, John Wiley and Sons, Hoboken, NJ, 2009, is written by Mark Peel, owner/chef of the Campanile, widely regarded as one of the best restaurants in Los Angeles but now closed while Peel gets involved in his next venture. Recipes in the book are patterned after simpler meals Peel served in the Campanile on Monday nights (Family Night) and are supposed to be easy enough that the home cook can prepare them. Carol did all the cooking, but as I peeked into the kitchen from time to time, it did not look that easy. Regardless, the end result was delicious, and there was plenty for 6 adults and 4 kids. Note that Carol’s recipe has substituted crab for lobster and contains no onion or its relatives except for a bulb of garlic. Also, the recipe is considerably simplified from Mark Peel’s original. For my part, forgive the images. I only had my iPhone on our excursion. ALERT: DO NOT ASK YOUNG CHILDREN TO HELP WITH THIS STEP. In a large pot lined with a steamer basket, bring the water to a boil. With tongs, lower the crabs into the pot. (Be careful – they will fight back.) Cover tightly, and cook for 12 minutes. Remove the crabs from the pot being careful to save the liquid. Chill the crabs in ice water. Drain and set aside. Measure the cooking water and add more water if needed to make 2 quarts. Strain through a chinois or other strainer, pressing the solids to remove any additional liquid. Return the strained broth to the cooking pot. Add the potatoes to the broth; return to the simmer. Add the fish and simmer for an additional 5 minutes. Then add the clams, mussels, and shrimp and simmer until the clams and mussels have opened and the shrimp is pink, about 5 minutes. Add the crabs, breaking off the legs and claws. 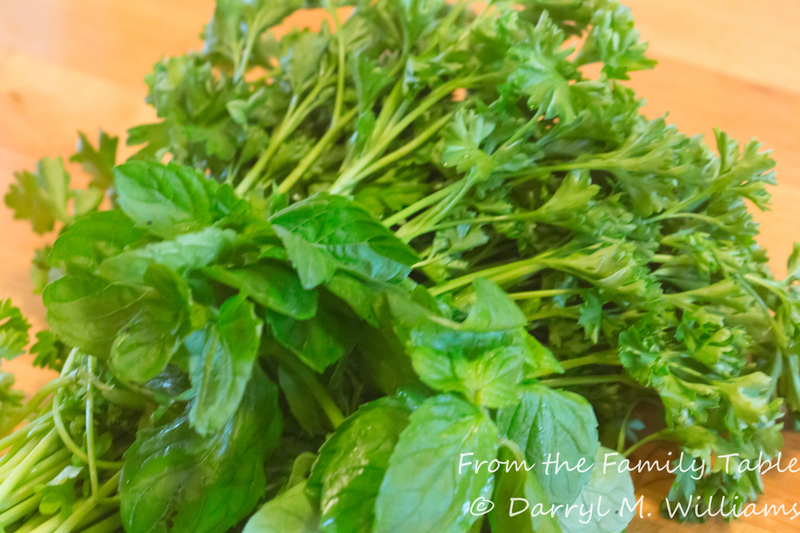 Adjust the seasoning and garnish with chopped parsley. Serve immediately with slices of toasted baguette seasoned with garlic and olive oil. Be sure to have some tools to break open the crabs along with a bowl for shells and plenty of napkins. When I was in my graduate program, I lived with the family of an old school friend. The mother was a good cook of the Betty Crocker/Good Housekeeping school, and there were still young kids living at home. We often had many of the classics – tuna-noodle casserole, macaroni and cheese, meat loaf – but a cheer would go up from the kids when they learned that dinner would include porcupine meatballs. It was even a celebratory dish for birthdays or good report cards. The meatballs get their name not from being made from porcupine meat but from the rice on their surfaces that supposedly sticks up like the quills on a porcupine’s back. You clearly need the imagination of a child for this creation. Honestly, I think that the reputation of the dish was overblown, but it really is something to make when you have run out of ideas for what to do with a pound of ground beef. And that’s exactly what happened. I had a pound of ground beef to use up, and I didn’t feel like the usual hamburgers or pasta with meat sauce. Then I thought of porcupine meatballs even though I hadn’t had them since my college days. They are easy to make with the single challenging step being the tomato sauce in which the meatballs cook. If you insist, you can make a very elaborate sauce. Alternatively, you can open a can of plain tomato sauce. Those two options run the gamut of hard to ridiculously easy and of tasty to why-bother. Fortunately, there is a middle road. I bought a large jar of Rao’s tomato/basil pasta sauce (straight from the world-famous Manhattan restaurant, according to the label), and that worked perfectly to make this an easy, one-pot meal. Put a green salad on the side, and you have all your food groups. Porcupine meatballs cooking in tomato sauce. In a large mixing bowl, soak the bread, torn into pieces, in the milk. Use a fork to mash the bread into a paste. Add the ground beef, egg, and tomato paste, and with your hands, mix until completely combined. Stir in the bell pepper, onion, garlic powder, salt, and pepper and mix until completely combined. Form the mixture into 8 meatballs. Place the rice in a shallow dish. Roll the meatballs in the rice until they are completely covered. In a large pot, brown the meatballs in the oil over medium-high heat. Add the pasta sauce, cover, and simmer for 45 minutes or until the rice is cooked. Some of the rice will have fallen off the meatballs into the sauce. For Christmas, Sarah and Evan gave us autographed copies of cookbooks written by some of their San Francisco colleagues and friends. They are all beautiful books, and certainly worth a place of honor on my cookbook shelves. Good and successful restaurants seem to go through the same sort of trajectory. First, there is the nervous anxiety after the opening and before reviews appear. Then, there are professional reviews, almost always glowing. Next come the Yelpers (I call them Whiners) with their smarmy comments: “Why do they charge so much; who do they think they are?” ” I could do better at home on my hot plate.” “They seated someone else at my table even though I was only an hour late for my reservation.” ” When I told them I didn’t like the filet mignon after I had eaten it all, they refused to comp me.” After the whiners, the real customers take over, and the restaurant is wildly popular. Then there are demonstration tours, and finally a thick, beautifully illustrated cookbook appears so that the diner can try making the dish at home – ha. Coi, Bar Tartine, and Flour+Water are three of the best, most popular, and most successful restaurants in San Francisco, so it is not surprising that they all have beautiful cookbooks. Here are some of my random thoughts on all of them. Coi: Stories and Recipes by Daniel Patterson (Phaidon Press, London and New York) is really more of a memoir than a cookbook, and it is illustrated with lush images of the California countryside along with relatively few food shots. 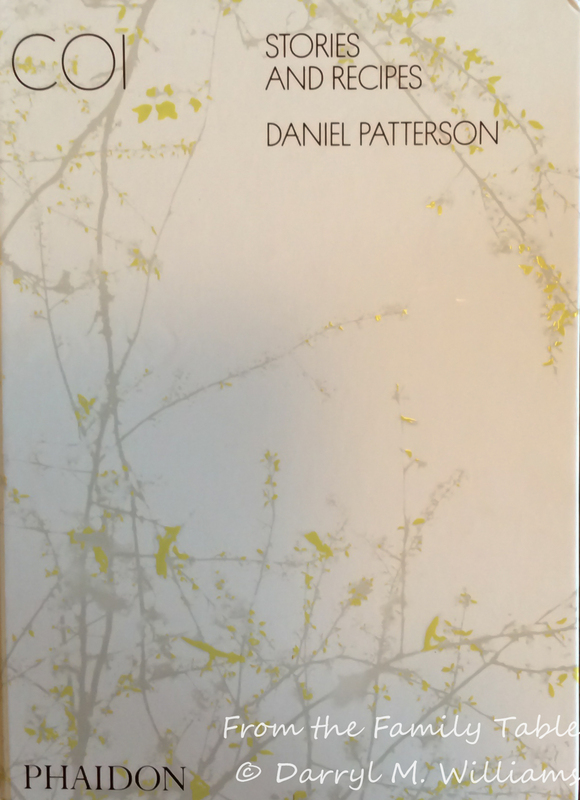 Daniel Patterson is an accomplished writer as well as a Michelin-starred chef. His writing has appeared in the New York Times, Lucky Peach, Food and Wine, and the Financial Times among other publications. The photographer, Maren Caruso, clearly knows how to operate a camera. Besides all that, Patterson is gracious in recognizing many of the cooks who have helped to make Coi a success. To be sure, there are “recipes” although they do not appear in the typical format of lists of ingredients and the steps in putting them all together. In my view, you can reproduce some of the dishes only if you study the instructions very carefully and already possess a high level of cooking skill. The most engaging parts of the book are the personal stories and philosophical statements – meditations, really – that accompany each of the recipes. The feeling that the reader comes away with is that of understanding the author as a thoughtful person as well as an accomplished cook. Bar Tartine: Techniques & Recipes by Nicolaus Balla and Cortney Burns with photographs by Chad Robertson (Chronicle Books, San Francisco, 2014) is reminiscent of Chad Robertson’s already classic Tartine Bread except that there is a lot more color. 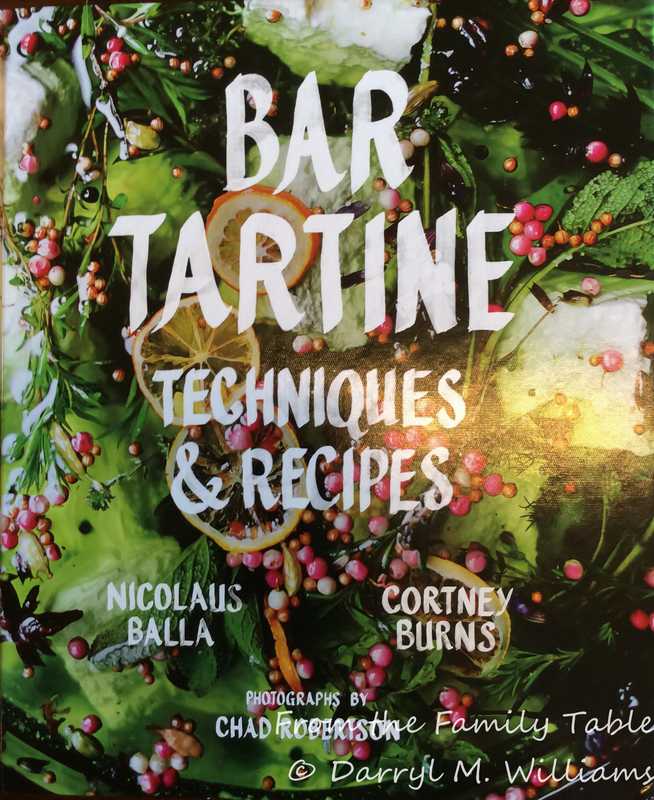 If you have been lucky enough to eat at Bar Tartine, you know that Nicolaus and Cortney have fun with their cooking. It has the same precision that you expect in high-end food, but at the same time it is playful. The chefs delight in using ingredients you may never have heard of, or in ways that you have never thought of. And that’s sort of how Balla and Burns approach their cookbook. There are delicious recipes and gorgeous images aplenty, but the emphasis is on ingredients The first sixteen chapters are devoted to topics like “Drying”, “Assorted Powders”, “Spice Mixes”, “Sprouting and Soaking”, “Oils & Animal Fats”, “Vinegars”, “Pickles & Preserves” along with suggestions about how to use ingredients like dried strawberries (The two love their dehydrator), kefir butter, schmaltz, and even burnt toast. The recipes look accessible but you will definitely need to expand your pantry. For me, the book is more like a beautifully illustrated instruction book than a conventional cookbook, and there are detailed instructions about how to make all of the powders and dried foods that serve as the basis of or as seasoning for the fabulous foods of Bar Tartine. The images by Chad Robertson add greatly to the final product, and in the credits, Balla, Burns, and Robertson also do all of the food and prop styling. The book is beautifully done and truly a labor of love, just like a meal at Bar Tartine. 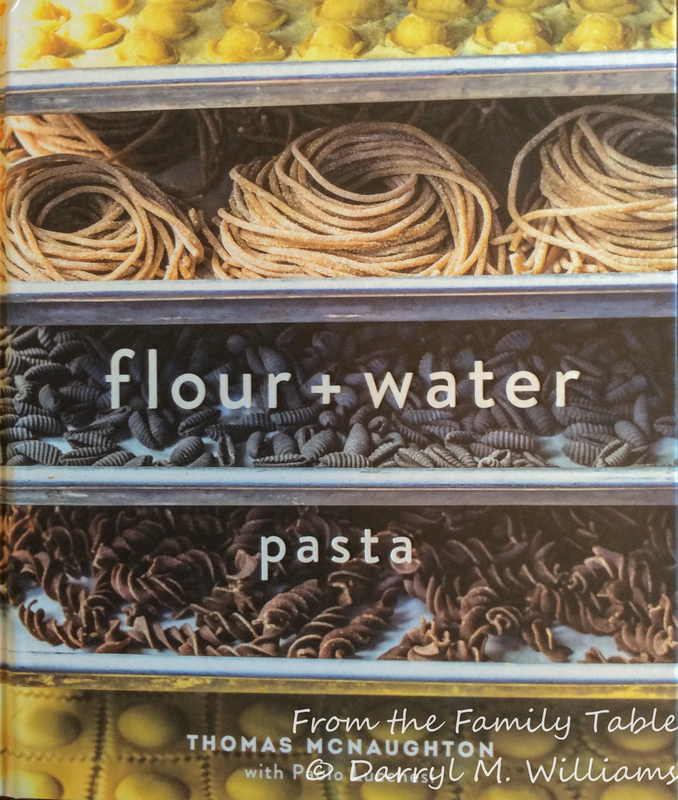 Flour+Water: Pasta by Thomas McNaughton with Paolo Lucchesi and photography by Eric Wolfinger (Ten Speed Press, Berkeley, CA) is a detailed treatise on pasta, but it is fascinating reading and studying. There is a two-page spread immediately after the frontispiece showing the author intent on rolling out a length of pasta dough. From that single image you get the feeling that McNaughton wakes up and goes to sleep thinking of pasta. His descriptions about seemingly arcane topics such as the differences between Italian 00 flour and semolina flour turn out to be fascinating reading. And coupled with detailed, well-organized images, the narrative provides step-by-step instructions that even a tyro is willing to try. There is also an abundance of recipes for what to do with the pasta once you have made it. “Mouth-watering” does not adequately describe the images of some of the spectacular dishes: spaghetti with black trumpet, poached egg, and cured yolk; burrata triangoli with preserved lemon, summer squash, and mint. A bonus is the back story of McNaughton’s pilgrimage to Italy and his long, humbling hours of learning how to make pasta under the tough guidance of a room full of Italian grandmothers. With that, the reader realizes that anything done well requires commitment along with hours, days, and years of practice.